Named after the nearby fishing village of Anstruther in Fife (which locals call Anster), this relative newcomer is a Cheshire-style cheese made by the St.Andrews Farmhouse Cheese Company with raw milk and traditional rennet. Low milk prices prompted Jane Stewart to start making the cheese six years ago, using raw milk from her husband Robert’s herd of Holstein Friesian cows. British territorials like Cheshire and Lancashire are so well known that there's a danger they could get taken for granted, so it's great to see new cheeses maintaining the tradition and expanding the range. Citrussy pale ales and medium dry ciders match the sharpness of 'crumblies' like Anster, but the pleasant acidity of Belgian wheat beers also works a treat. 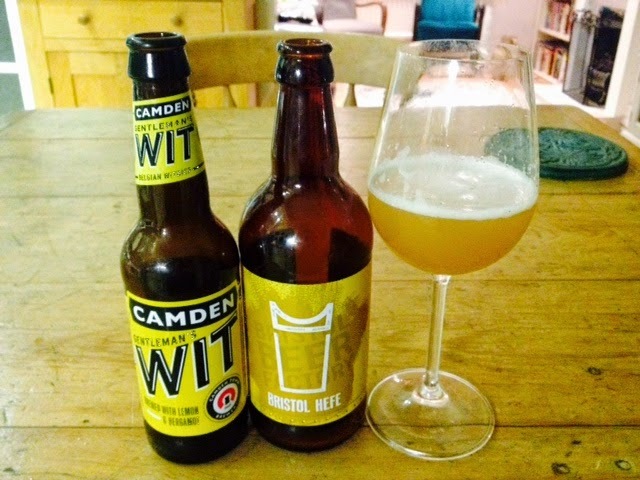 Camden's Gentleman's Wit - a Belgian-style white beer made with lemon and bergamot - is a cracking match for Anster. It's light and crisp to match the bite of the cheese, but with an interesting mix of floral, perfumed notes that play on Anster's savoury edge. I also tried it with a German-style wheat beer (Bristol Hefe on the right), but its big orange and banana flavours overpowered the cheese. Damn good beer though.